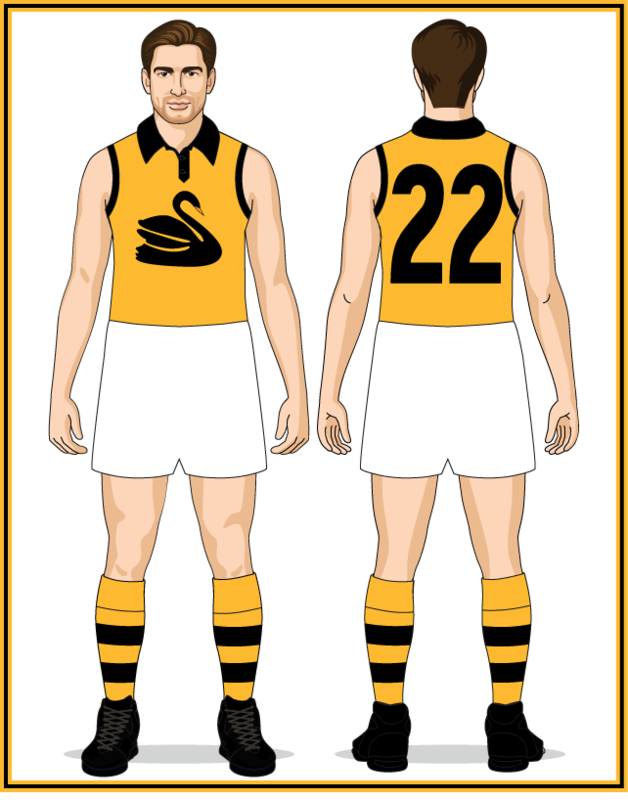 After thirty years of being referred to as the "green and golds", some within Western Australian football felt the time was right for a major overhaul of the State's football uniform. However, as with the revamp of 1924, this move did not proceed without opposition. Initially, the change barely rated a mention in newspaper reports of the WANFL's annual meeting held on March 27th, 1935. The big story of the night was the league's President of 1933, Mr. Stooke being opposed for re-election by former President Mr. Moffat who had led the WANFL from 1920 to 1932 before resigning in protest at a prominent player being cleared to Victoria. Not one to be easily deterred, Rodriguez fought back the following week: "Mr. Rodriguez... stated that he would seek rescission of the of the motion on the books that had wiped out the agreement to make the State colours black and gold" [The West Australian 11-4-1935, p.9] The same night he also gave notice that he intended at the next league meeting to have the name of the Claremont-Cottesloe club changed to Claremont. Within five weeks both motions had passed, changing the face of Western Australian football in the process. 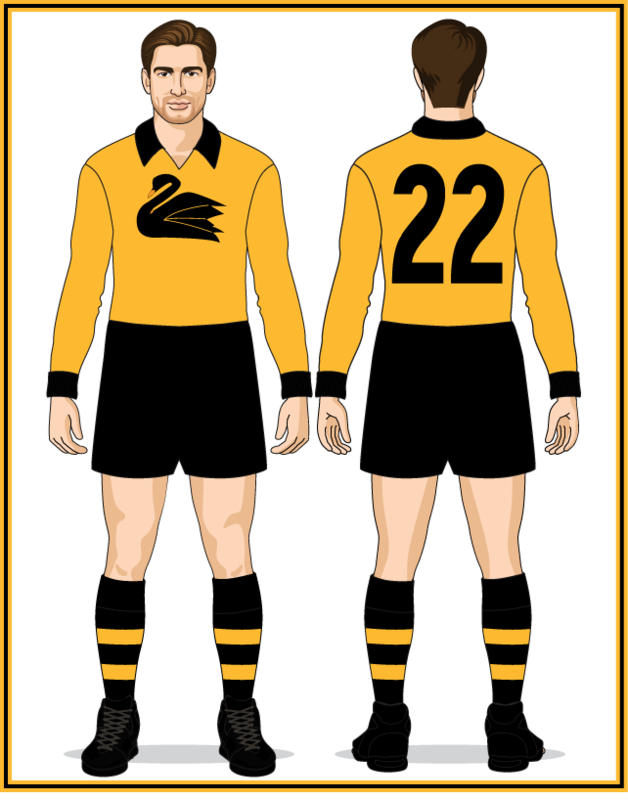 The socks on this uniform are predominantly gold instead of black, and the swan faces the other way, but otherwise this design is the prototype of the classic Western Australian State uniform still worn today. As with the 1927-30 and 1933 uniforms, black shorts were worn versus Victoria and white against all other opponents. This WA uniform was also the first to utilise the State's colours that had been in use as far back as 1870 on the Colony's flag. The sole change was to the socks: the black hoops were moved higher, allowing three black hoops instead of the two worn the previous season. NOTE - no match was played against Victoria in 1936 so only white shorts were worn. 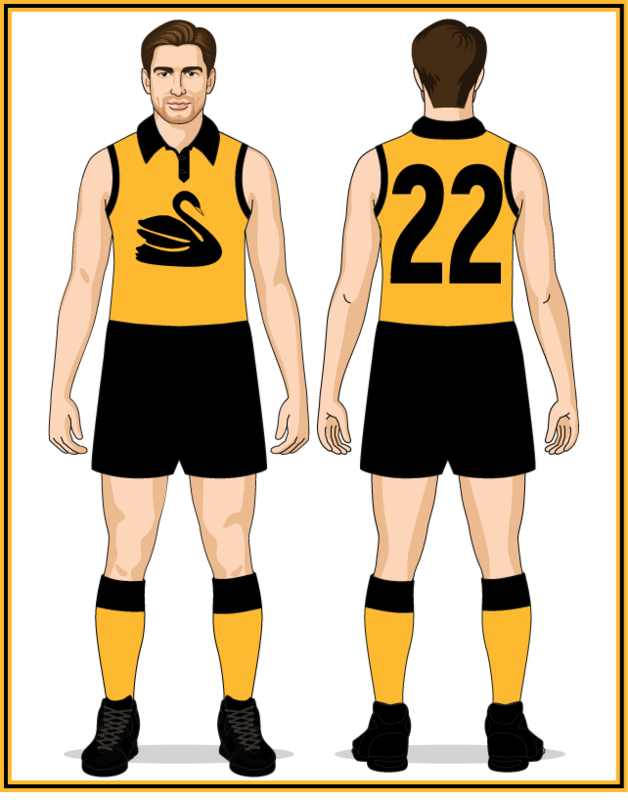 The socks were inverted from predominantly gold to black (the same design that was later worn throughout the 1980s State of Origin-era). In what had become an annual event, the sock design was changed again. The hoops were slightly thicker than before and the top gold hoop was removed. 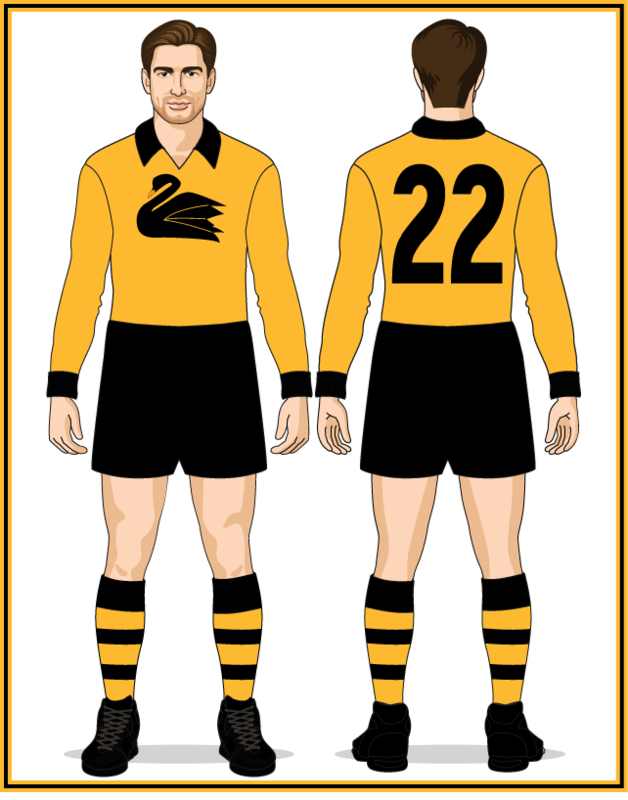 NOTE - although WA played Victoria in 1938 the Vics chose to wear black shorts, meaning WA wore white in all their matches that season. It was only the second time since 1904 that Victoria had worn coloured shirts (the other being against the VFA in 1932) and it did not happen again until 1962 versus WA. WA only played Victoria in 1939 so white shorts wore not worn that season. The sock design was modified for the fifth time in five seasons (see below). This was the most radical change with the hoops being discarded in favour of a gold sock with a black top. 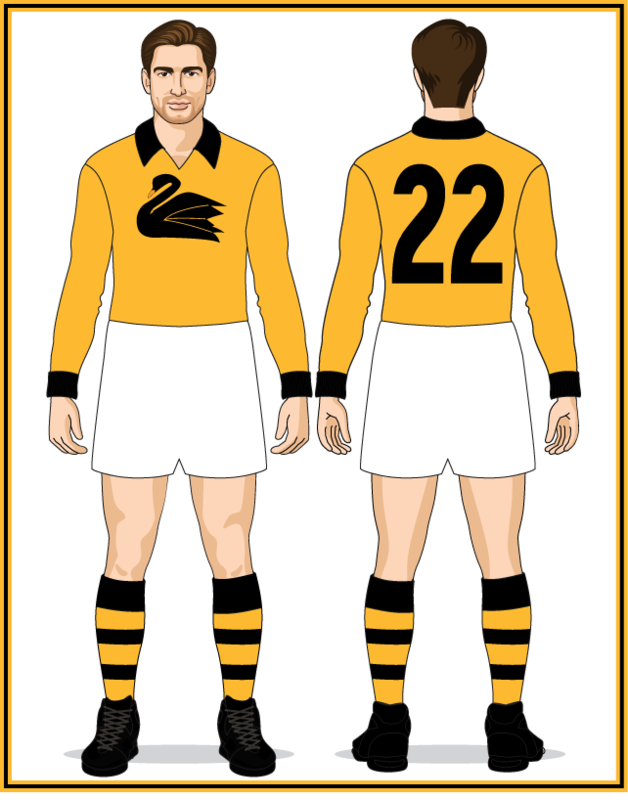 This was the first long-sleeved guernsey since 1934 and it featured a new swan design (facing the standard direction, unlike the 1935-39 version). - the swan moved higher on the jumper, so its head now finished alongside the button-up neck of the jumper instead of below. - white trim was added to the inside of the neck (this was highly-visible in photos of players with the neck of the jumper unbuttoned). 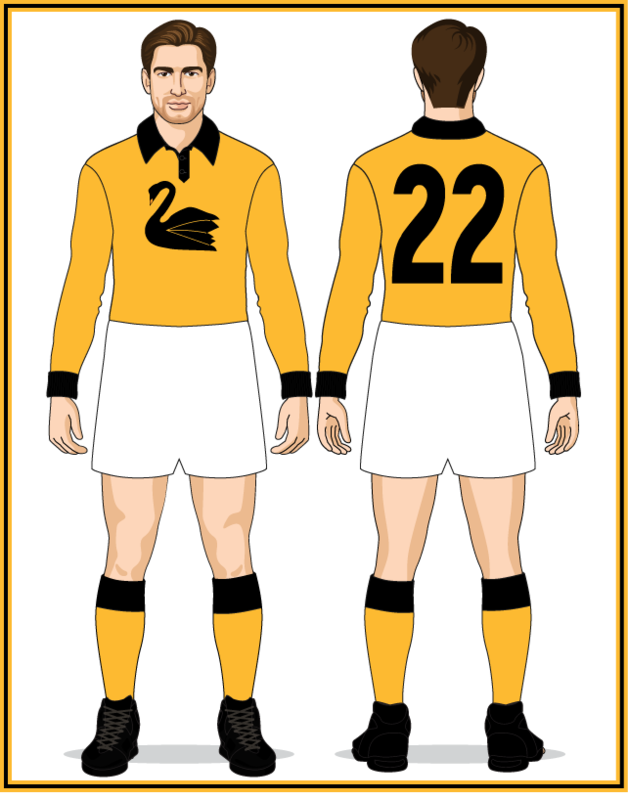 The neck design changed to a button-less v-neck that was gold instead of black. 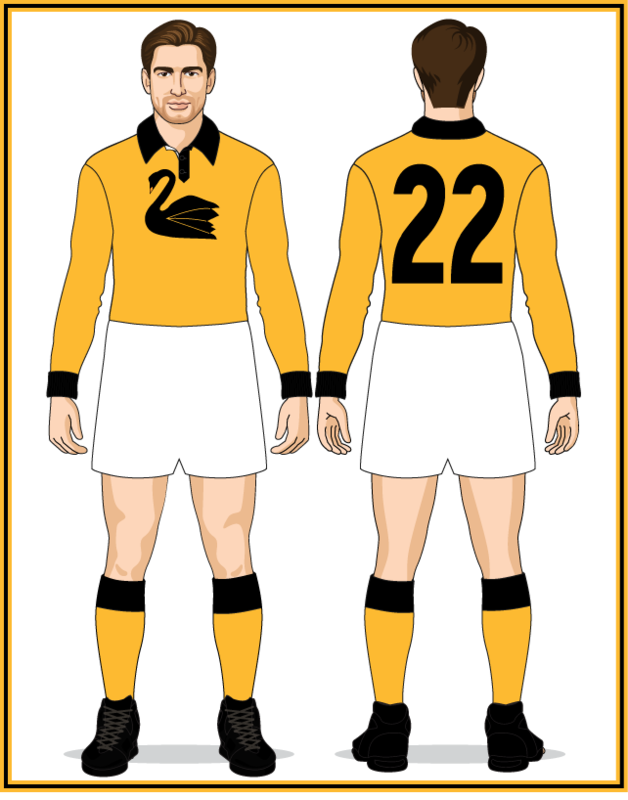 A return to hooped socks, similar to the 1937 design. The hoops on the socks were thinner and changed from 3 gold hoops to 2 (providing a very different look to the 1952-55 design).